Presentations and proposals can take a number of forms, and in this case we created a small booklet to accompany the orals presentation given to a national CPG company on the implementation of Workday systems for their organization. Using bold, monochromatic graphics and clear visual storytelling, Deloitte won the account to assist this organization on their implementation goals. This proposal was concerned with the implementation of workday systems. The consulting team needed to manage the implementation of many phases along the way and we conceived an orchestration theme to push the idea of multiple parts working in harmony. Within, rather than creating a gantt chart (frequently named a "roadmap" in the consulting world) illustrating the journey we would take together, we visually created an actual roadmap, in which color coded footprints signify how Deloitte would initiate the journey as the lead but over the course of time, the client would become empowered to lead their own journey with Deloitte acting as a supporting agent. 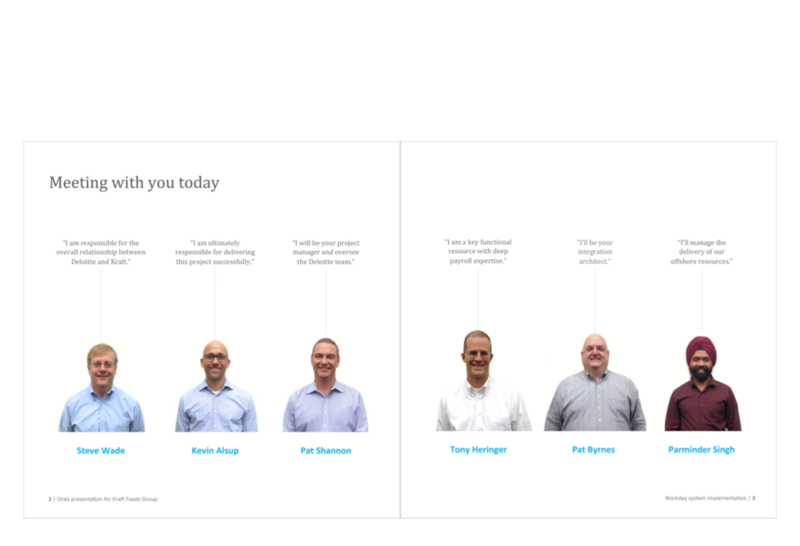 This is another reimagined consulting spread, usually the client facing team is portrayed in a block format with low quality web images paired names and titles. In this spread, we made a point to take high quality photos, silhouette them, and add a line above highlighting what the individual portrayed would be responsible for on the engagement. Using the original roadmap from the opening pages, we created a zoomed in version to elaborate on sub-phases that occur within the originally defined phases, continuing to promote the concept of the journey we were embarking on with the client. Using white space and single sentence copy to illustrate details, the client was be able to follow along with the presentation without losing focus on the speaker.